This is Zora. 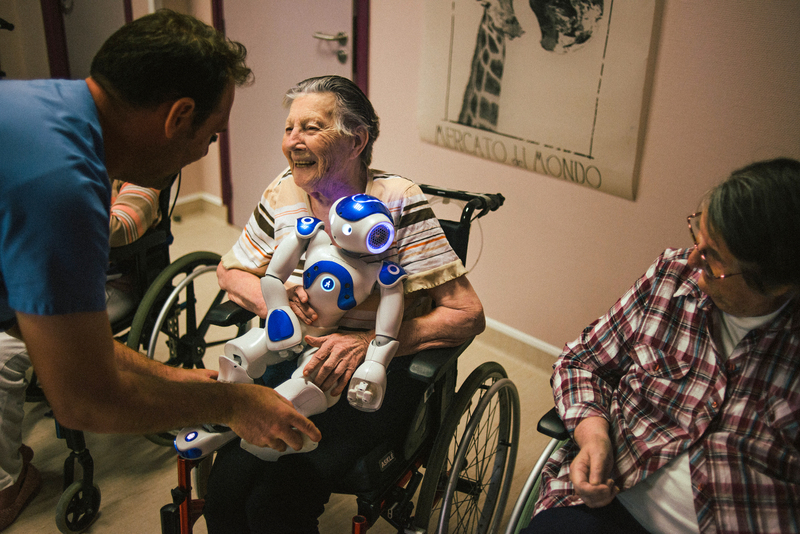 It may not look like much — more cute toy than futuristic marvel — but this robot is at the center of an experiment in France to change care for elderly patients. When Zora arrived at this nursing facility near Paris, a strange thing began happening: Many patients developed an emotional attachment, treating it like a baby, holding and cooing, giving it kisses on the head. Zora offered companionship in a place where life can be lonely. Families can visit only so much, and staff members are stretched. Patients at the hospital have dementia and other conditions that require round-the-clock care. Zora often leads exercises and plays games. It can have a conversation because the nurse (out of view) types words into a laptop for the robot to speak. Zora doesn’t dispense medicine, take blood pressure or change bedsheets, but its Belgium-based provider has sold over 1,000 of the robots (at $18,000 each) to health care facilities around the world. In nearly every country, the population of older adults is rising. The number of people over 60 will more than double to 2.1 billion by 2050. There simply won’t be enough people for the required health care jobs, so new technology must be created to help fill the void, writes The New York Times (Nov. 27, 2018). The challenge is particularly acute in France, where hospitals have been facing a national crisis, with health care professionals striking and protesting budget cuts and staff shortages. In Australia, a hospital using a Zora found that it improved the mood of some patients, and got them more involved in activities. And patients have told the robot things about their health they wouldn’t share with doctors. What can and can’t Zora do? Where else can “service robots” make their mark?